ATO Laws regarding capital gains tax conditions and exemptions relating to your main residence can be confusing. This article aims to eliminate the confusion. Main residence CGT (Capital Gains Tax) exemption can be extended to cover the time it takes to construct (or repair) that residence. This is sometimes referred to as the “building concession” or “four year rule”. What is a building concession? The “building concession” allows a taxpayer to choose to treat land they have acquired as their main residence during the period that they “construct, repair, renovate or finish building” a dwelling on the land. The land at the time of acquisition may or may not contain an existing dwelling, or if there is a dwelling, the taxpayer has vacated it in order to carry out repairs. Note that vacant land may also be treated as a taxpayer’s “main residence” if it is vacant because the taxpayer’s home has been destroyed. What are the conditions for a dwelling being treated as a building concession? For the concession to apply, the dwelling must become the taxpayer’s main residence “as soon as practicable” after building or renovations are complete, and must remain so for at least three months. Further, the concession applies for a maximum period of four years from the time the taxpayer acquires the land, or ceases to occupy a dwelling already on the land, until the constructed or repaired dwelling is occupied as the taxpayer’s main residence. This is the reason the concession is sometimes also referred to as the “four year rule”. In limited circumstances, the Tax Office can exercise some discretion to extend this four year period. where a family member has a severe illness. What happens if the four year period expires? 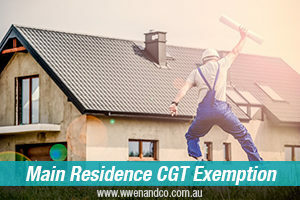 If more than four years pass before the constructed or repaired dwelling is occupied as a main residence, a partial CGT exemption can apply in respect of that excess period. What if a dwelling is destroyed or compulsorily acquired? A taxpayer can choose to apply the main residence exemption to a property even if they no longer live in the property. This rule is commonly referred as the “absence concession” or sometimes the “six year rule”. The requirements for this rule can be tricky, so you may be wise to consult the experts at our office for further information. If a dwelling that is subject to the absence concession is destroyed or compulsorily acquired and land is bought on which to build the replacement (“substitute”) dwelling, the building concession can also be used in these circumstances to preserve the effect of the absence concession in relation to the substitute dwelling. The land however must be acquired within one year after the income year in which the original dwelling was destroyed or compulsorily acquired (although there is some discretion allowed by the Tax Office). Can the concession apply to vacant land for the period after the dwelling is destroyed? Yes. The concession is also available if a main residence is accidentally destroyed (such as with a bushfire or flood) and the vacant land is subsequently sold or disposed. Please note that the destruction must be by way of “accident”. The concession will apply to treat the vacant land as the taxpayer’s main residence for an unlimited period of time from when the dwelling was destroyed until the disposal of the land, provided the dwelling was the individual’s main residence at the time of its destruction, or taken to be by way of choosing to apply the absence concession, and no other dwelling was subsequently built on the land. If you choose to apply the concession, no other dwelling can be treated as your main residence during the period it covers.